According to sources Google Search results today prove that the human element has almost been taken out of the equation. Meanwhile if one were to type 'bar girl in India' or 'Italian Bar girl', the most likely result would throw up the name of former Congress president Sonia Gandhi. Reportedly the world saw US Congress representatives grilling Google CEO Sundar Pichai on search results for the word 'Idiot' relating it to US President Donald Trump. Recently Pichai explained in layman's terms that there was no political or human bias involved, nor was there any manual intervention. Reports added the search ranking is driven by the algorithm of an advanced computer program which matches the word to the result and it has been suggested that this page rank algorithm is not entirely insulted from being tweaked, though Pichai would prefer to beg otherwise. 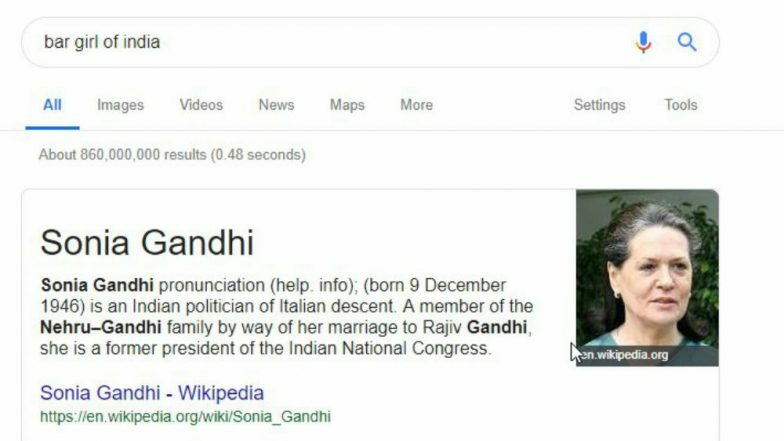 Moreover Google search results related to Sonia Gandhi have already begun to go viral on social media groups especially on WhatsApp. Meanwhile Google's intention may be to get maximum user engagement and ensure that more users spend time on Google platforms with the data thrown up by the search engine, this is one of the inherent flaws in its system.